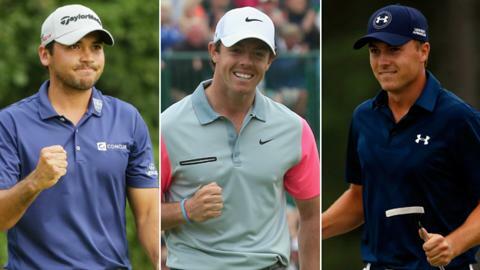 Will Jason Day, Rory McIlroy and Jordan Spieth live up to their billing as the "big three"? Jordan Spieth insists it is too soon to say he is part of a new "big three" succeeding Tiger Woods in dominating world golf. After a season in which the 22-year-old triumphed at the Masters and US Open, he has inevitably been bracketed with four-time major champion Rory McIlroy and US PGA winner Jason Day in the vanguard of the game. They are the top three players in the world with current number one Day the oldest at the tender age of 27. "I think it's a bit soon," Spieth told BBC Sport when asked if he along with Day and McIlroy were filling the vacuum left by the ailing Woods. "I think for Rory it's a bit different because he's been consistent for a number of years now. "We've played solid golf for the past few years but in order to create an era you almost need a decade like this to really make a difference. "We have the potential to do it, but this was the first year of it," added Spieth, who won five times in the 2015 PGA Tour season. The Texan believes an enduring rivalry with Day, also a five-time winner, and 26-year-old Northern Irishman McIlroy, who led the rankings at the start of a season blighted by his July ankle injury, depends on many influences. "We are aware of it and it drives us but there's a lot of factors needed in order to create it," Spieth said. "It may be a bit premature to say it now but I do believe there was a step needed in the right direction and it took place this year. "And if we can ride with that it'll be significant." How do the 'big three' compare? Spieth begins his 2016 PGA Tour season at this week's HSBC Champions tournament in Shanghai. He is returning after a three-week break following the US Presidents Cup victory in Korea. Behind only Day in the world rankings, he did not touch a club for a fortnight before this year-ending spell in which he will play a trio of tournaments. "My energy level is high," Spieth said. "I was able to get some rest and then over the past couple of weeks get in to the gym, trying to put weight back on and get ready for three events in what I consider my off-season." After competing in China he will return home to the United States before defending his titles at the Australian Open and the World Challenge in the Bahamas next month. Spieth's victories in those tournaments last year laid the foundations for his stellar performances in 2015. He said: "The off-season last year was arguably the most important couple of months in my career. "I learned how to win and how to really close events out. How to get yourself in contention and then have the patience to be able to pull it out." It was during the United States's victory over the Internationals at the Presidents Cup last month that he finally took stock of his level of achievement in 2015. "It's tough for me to wrap my head around what was obviously a season unlike any I've ever had," Spieth said. "It's still so early in my career it's hard for me to compare to others. But what an exciting year it was for golf, I mean with so many young players, for golf, playing so well. "If Rory was healthy for the whole year he would have made a bigger impact than he was able to make in a shorter season. "And then with what Rickie Fowler did this season, breaking through with three wins and Jason and myself it was exciting. "It was really cool," he added. "I can look back on my year but, at the same time, if I look at these other guys, who want to win just as bad as I do, it drives me a bit more." There is every reason to suggest Spieth's career will go from strength to strength. For one so young it is also abundantly clear he possesses an extraordinary sense of perspective. He is an accomplished ambassador, keen to say the right things and gain more than trophies from his global travels. "It's time to travel overseas and see the impact you have and how you can grow golf around the world," he said. "It's really special coming to China and seeing a lot of junior golfers out and about. Any impact you can have to grow the game, that's ultimately what we are all really here for. "We obviously want to play for our own accolades but when the sun sets on your career you want to have influenced people in the right way and this is part of it." It is too early to talk about this being a new era for the game, but if Spieth progresses in the same vein, along with McIlroy and Day, the game is in safe hands.